Following is the confirm workshop timing. Please also download the detailed lesson plan in PDF here. 25th November – Top 20 Winners uploaded. 12th November – Anne Qi Hui emerged as top S’pore fnisher. 29th October – Page info posted. The Great Eastern Women’s Run, commissioned by Great Eastern and organised by HiVelocity Events, is a run for every woman. The race features 5 km, 10 km as well as 21 km race distances making the run accessible to female runners of all levels. This will be the first women-only half marathon in the region. 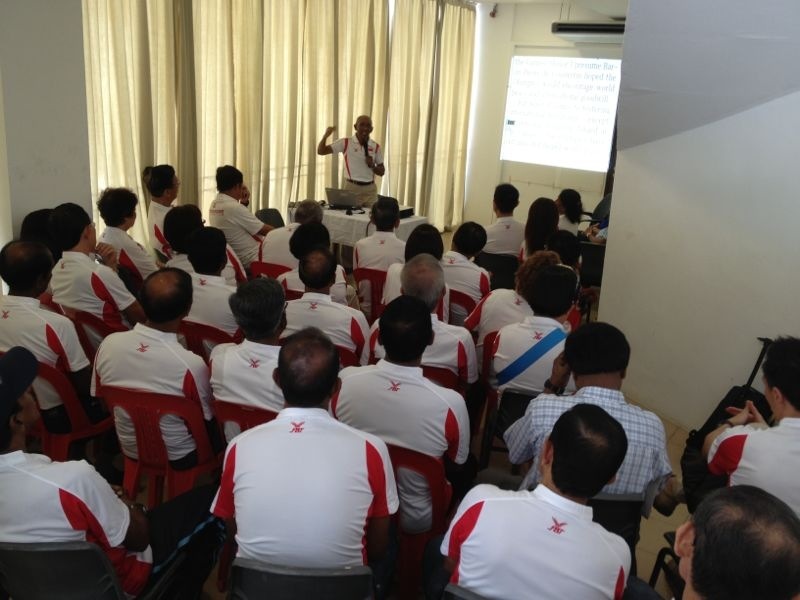 Targeting to attract more than 15,000 participants, the Run will be flagged-off at the The [email protected] Bay. This run is a SAA sanctioned event. The route has been measured and certified, following the international IAAF rules and regulations of the sport and to provide a safe environment for the participants and spectators, and also the official recognition of national best performance for road events. *Please note that the start times are subjected to changes. The race route will take runners past Gardens by the Bay, Marina Bay Sands, Merlion Park, Esplanade, Singapore Flyer, F1 Pit Building, the future Sports Hub and end back at the The [email protected] Bay. Anne Qi Hui currently holds Singapore National Best Performance for women 10,000 metres road event with a timing of 38:09 minutes. 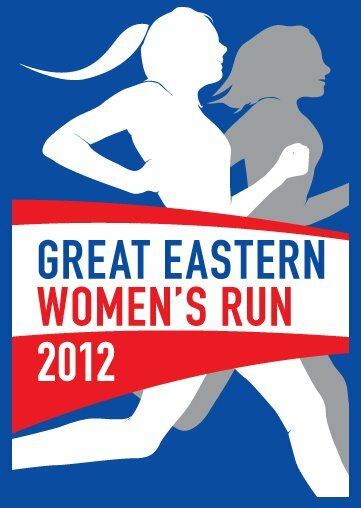 She established the mark last year at Great Eastern Women’s Run 2011, 3rd July. Last year a total donation of $20,000 for adopted charity Breast Cancer Foundation was collected. The event was first held in 2006, where 3,600 women joined the inaugural year of then named ‘Women 10K’ and supported the charity group, Women Make A Difference. Dipna on the left of the photo, and Matthew on the right. Respective national record holder in the women 100 metres hurdles and men long jump, Dipna Lim-Prasad and Goh Yujie Matthew aside from picking up medals at SAA just concluded National Championships, they were both awarded Best Performance Award. For the female category, 21-year-old Dipna achieved 927 points via her women 200 metres event. Her winning time of 25.63 seconds (0.2m/s) was good enough to clinch the individual award. Although she scored higher in the 100 metres hurdles women event, some 937 points, it wasn’t counted as the race was a specially held time-trial to help her qualify for the upcoming ASEAN University Games. As for the male category, 21-year-old Matthew jumped 6.88 metres (-0.5m/s) from day one of competition in the men long jump, garnering 892 points. He was duly awarded the award. Only Under-23 years events are accepted and the points are tabulated using 2011 IAAF outdoor scoring table. Each of them will be awarded $500 prize money. 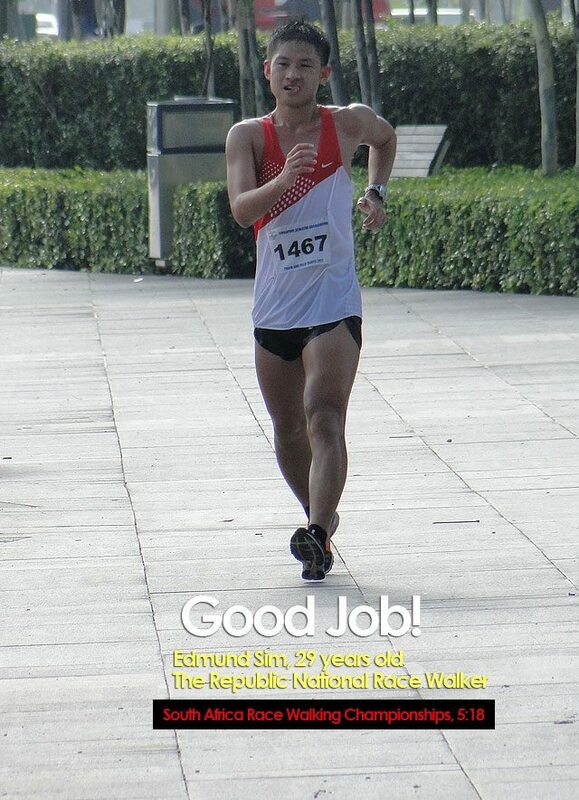 The Republic top race walking athlete, Edmund Sim has failed in his bid to break the long-standing 50 kilometers road men walk (5:07:03 – Arumugan Kannan, 1969) event last Saturday. Although unsuccessful he walked away with a new personal best, shaving off some 46 minutes from his last best effort of 6 hours and 4 minutes set in December 2011. The 29-year-old was in Cape Town South Africa for the Race Walking Championships . Edmund crossed the finishing line in a time of 5 hours and 18 minutes, his final position four out of a total eleven competitors. SAA would like to thank Athletics South Africa for taking care of our athlete. For male – 21-year-old Matthew jumped 6.88 metres (-0.5m/s) from Day 1 in the men long jump, garnering 892 points. For female – While Dipna Lim-Prasad achieved 927 points from the women 200m event, clocking 25.63 seconds (0.2m/s) from Day 1. Singapore athletes interested in participating in the event, please seek sanction and register your interest below. All entries should reach us by 20 October, Saturday. Registering your interest is now closed.